You may recall that the 0 card in the Rider-Waite (RW) tarot deck is The Fool and in the Angel Tarot deck, it is renamed as The Dreamer. In card number 5 we see another change in names. In RW tarot, 5 is The Hierophant. In Angel tarot, 5 is Unity. 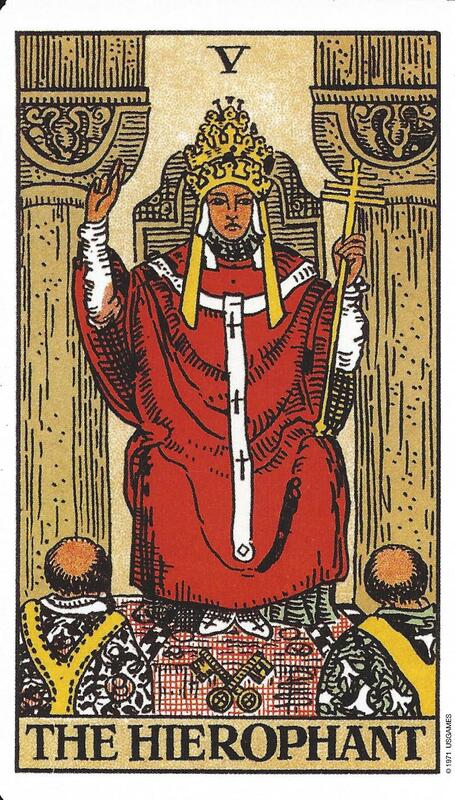 In the RW tarot, card 5 (V) is The Hierophant. Hierophant is another name for the Pope and in older decks, the 5 card is The Pope card. Hierophant is derived from the Greek words hieros and phainein meaning sacred and to show. This religious figure is concerned with doing what is best for the community. The Hierophant asks us to be balanced, compassionate, and enlightened. The path to enlightenment has many roads and this is seen in the symbolism of the seven orbs on The Unity card. While not all belief systems are circling Archangel Sandalphon, the idea is that the energy is all-inclusive. The number 5 signifies a blending or balancing of the four elements–earth, fire, air, and water–with a sense of spirituality. On both cards, there is a set of keys crossed. In RW tarot these represent the keys to heaven; in Angel tarot, they represent the conscious and subconscious. 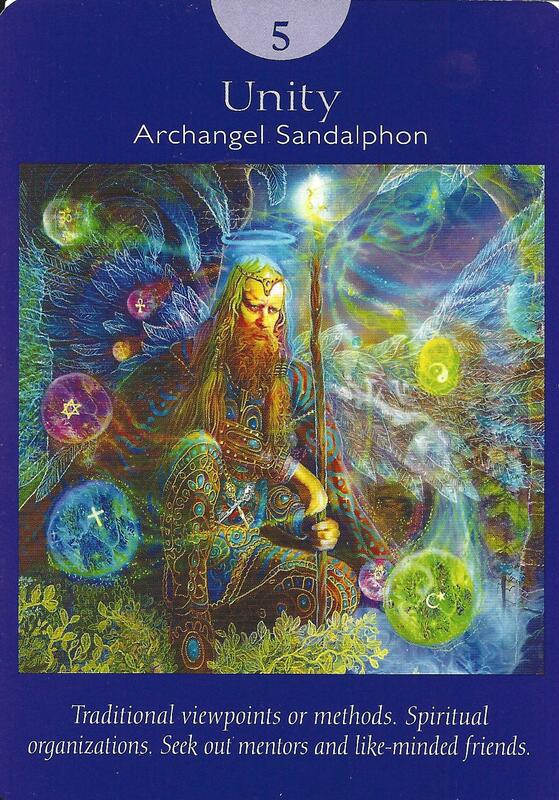 Archangel Sandalphon can deliver prayers from Earth to Heaven. He helps us with desires for a more loving and benevolent Universe. When the Unity card is drawn, it is also a duality card meaning there can be two ways to interpret the meaning or reason for the card. First, we may be asked to continue our path but pay closer attention to tradition and keep with what has worked before. The alternative is that we may be being asked to deviate from the norm and step outside of the box and be creative in our thinking and behavior. In either case, we continue our journey doing what is best for the community or society at large. Sometimes this card represents a challenge a Querent may be having about doing what is right. We are challenged to learn more about ourselves. For example, why do we want a specific career or how does our dream benefit the greater good. Drawing the Unity card can mean that it is time to find a spiritual mentor or join a spiritual group where we can be supported in our spiritual journey.